Every year, on my birthday, I choose a Bible verse that I feel God wants me to memorize and apply to my new year. The verses are always placed so strategically in my day that it couldn't be more of a clear sign that they are from God. My birthday was last week. I had been reflecting on this last year, and was repeating to myself the birthday verse of 2014. "Come, let us return to the LORD. For He has torn us, that He will heals us. He has wounded us, but He will bind us up. On the third day, He will raise us up so that we may live with Him forever..."
Believing in a sovereign God is not easy. Many times it's so testing on my finite mind that I must remind myself 'You believe He is sovereign because He is God.' Because if He is God, but not sovereign we're gonna have big problems. Oh but wait. Read that passage from Hosea again. It says that He breaks us. And tears us. But He won't leave us like that. He will heal us. He will bandage us up. "For we know that all things work together for good to them that love God; to them who are called according to His purpose." With the comfort of that promise, we can rest in assurance and peace that no matter what great trials cross our paths. He is bigger than it. He has a purpose for it. And He is never far from our grasp. He is a God of comfort. "I am filled with comfort. I am overflowing with joy in all our affliction." How could Paul be so joyful in his afflictions? Because he is comforted by this sovereign God. The LORD will never abandon us. He won't see us going through the storm He designed without holding our hand and walking with us against the wind and sleet. He is ever-present, ever-sovereign, never-changing. Trust the sovereign God who tears, so He will heal; Who wounds, so He will bandage. Look for and pray about the lesson He is teaching you amidst these. And remember the comfort He offers. "Let us know. Let us press on to know the LORD. His going out is as sure as the dawn. 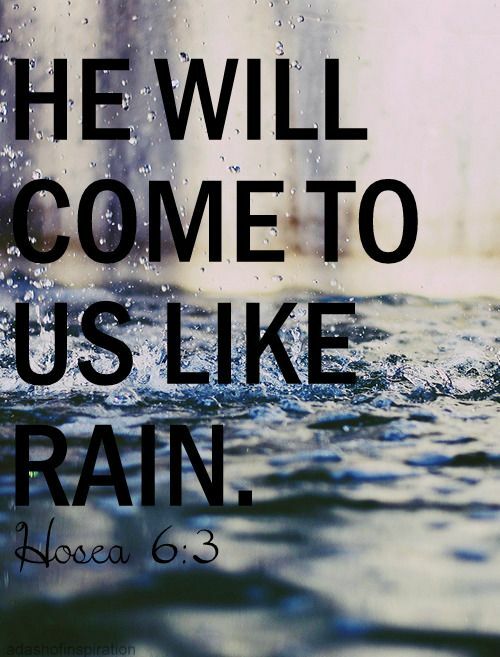 He will come to us like the rain, as the spring rain that waters the earth." Amen and amen. It is so sweet to see that through all the trials and tribulations the Lord is RIGHT THERE waiting for us to turn to Him. He may allow hard things to happen so that we can grow in Him unto maturity, but we must NEVER forget that God's heart is ALWAYS good towards us. Sweet thoughts Raquel, thanks for sharing. Amen. Praise God for His constant love for us.